Waking up on the wrong side of the bed is not a good start of the day, and getting on the cold old floor can make it even worse. A good flooring complements to the visual appeal of any interior and makes people's live warmer and nice on the touch. Where to find the right one? In online shop, the professional design for which you see here. Visually rich, with bright green accents, this layout effectively showcases all items and focuses attention on the featured ones. Allowing navigation via categories and dropdown menu, it offers easy shopping. Be sure, that visitors will like it as long as the pleasant atmosphere of your shop design based on this theme. Pretty! This template is pretty incredible! We love this theme, it is definitely one of the best time-saving tools for web development we have been searching for in a very long time. It is very well tailored to the needs of our industry. Our team has been using your web developing products with varying degrees of satisfaction, but this theme beats the heck out of those. We just love it! It&rsquo;s customer service team is also very knowledgeable! I have purchased this template because it has a very beatiful layout, the effects over the pictures and the simplicity of navigation. I am a freelance webmaster and I have the intention to make a furniture e-commerce for my customer. It will be the first time that I make an e-commerce, and I am very curious to see how it will appear on the web. how much editing can I do to this template? 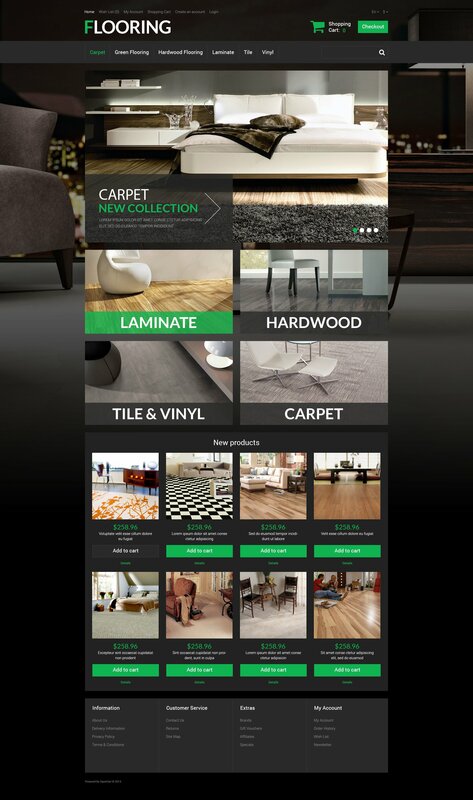 I need a web-site for a flooring installation business with no shopping cart just the business information. I also have pre- made logos and want to make sure I can just put in on here. Good for interior furniture, hobbies, gifts, sport, fashion stores.